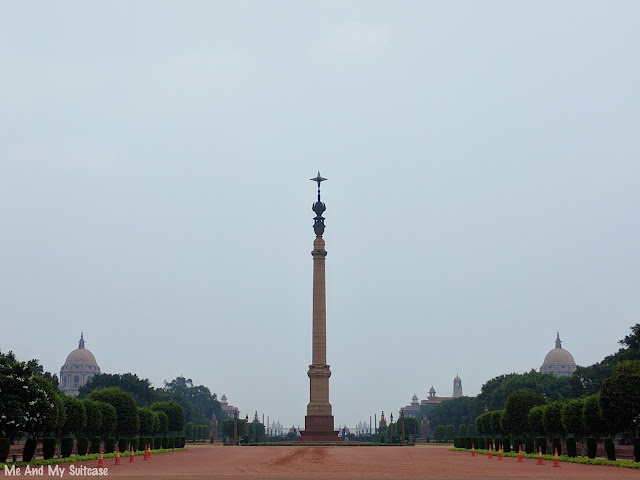 The day I was in the house of Rashtrapati of India aka Rashtrapati Bhavan. 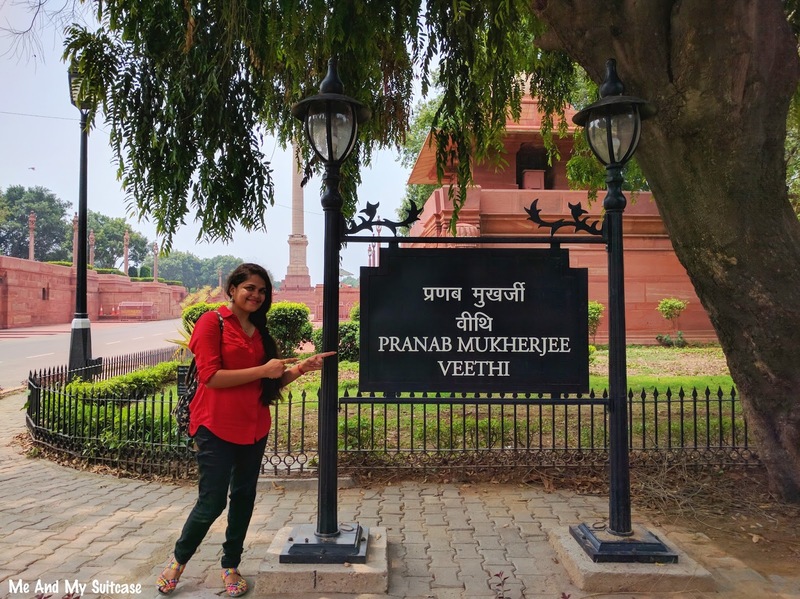 Picture Credits: Mithila - "Picture from the year 2016"
A business trip was planned to Delhi, I and Mithila (my ex- colleague) were busy booking our tickets when I suddenly remembered that Rashtrapati Bhavan hosts day tours. 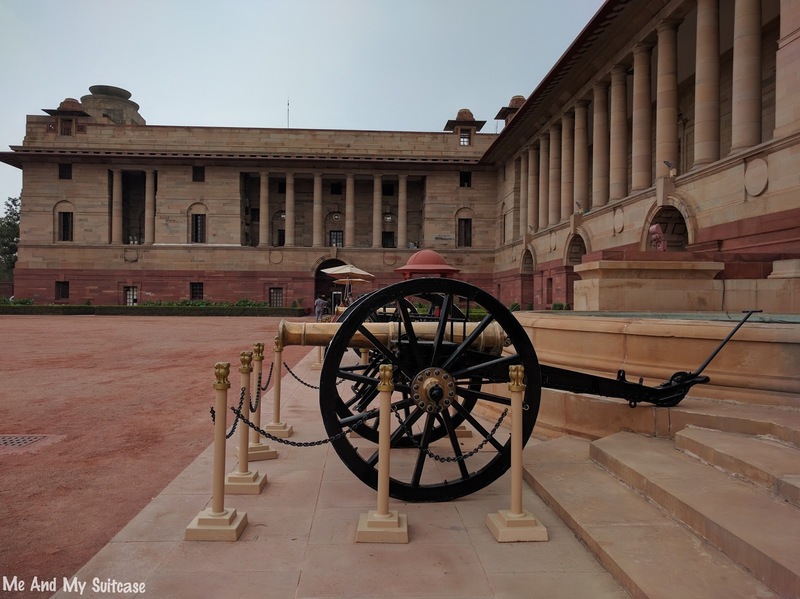 Not many people know about it but it is interesting how easily one can request for a visit to Rashtrapati Bhavan and can book online. 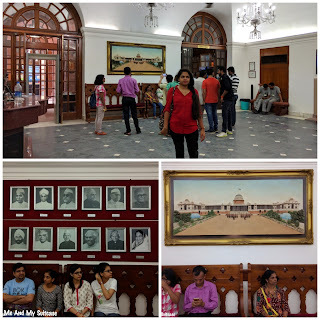 Without wasting a moment, I and Mithila booked a tour of the Grand House of the President of India. 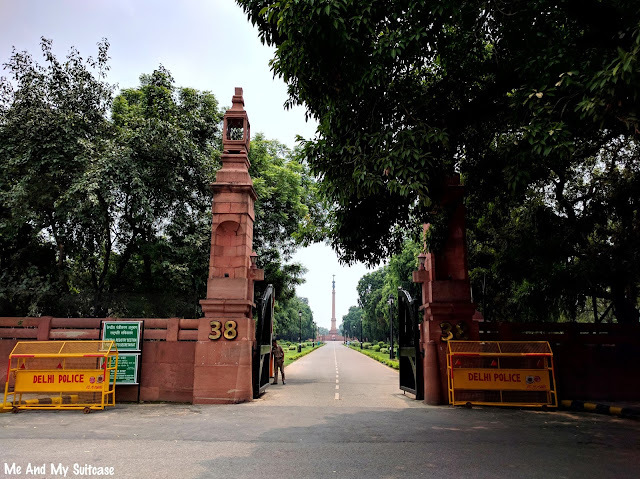 Whenever I visited Delhi, I always crossed India Gate and Rashtrapati Bhavan some times on my way to office, some times way back. They never cease to amaze me; the symmetry, alignment, aura. 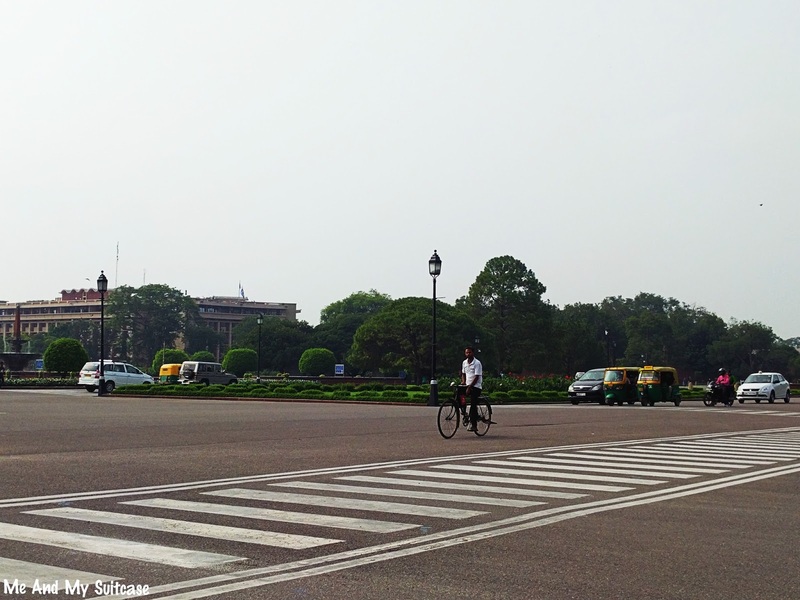 The grandeur of Rashtrapati Bhavan is impeccable so is the mood around India Gate. 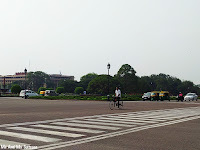 On many days I had even asked cab-wala to take me through the roads near by Rashtrapati Bhavan, such is its charm. Now the Presidential House or the home of the President of India was originally constructed as the Viceroy's House when the capital of India was shifted from Calcutta to Delhi by the Britishers during British Raj. Located at the Western End of Rajpath (Delhi), it is a 340 room building which forms part of a huge 320 acre Presidential Estate which also includes Mughal Garden, large open spaces, residences of body guards and staff, stables etc. 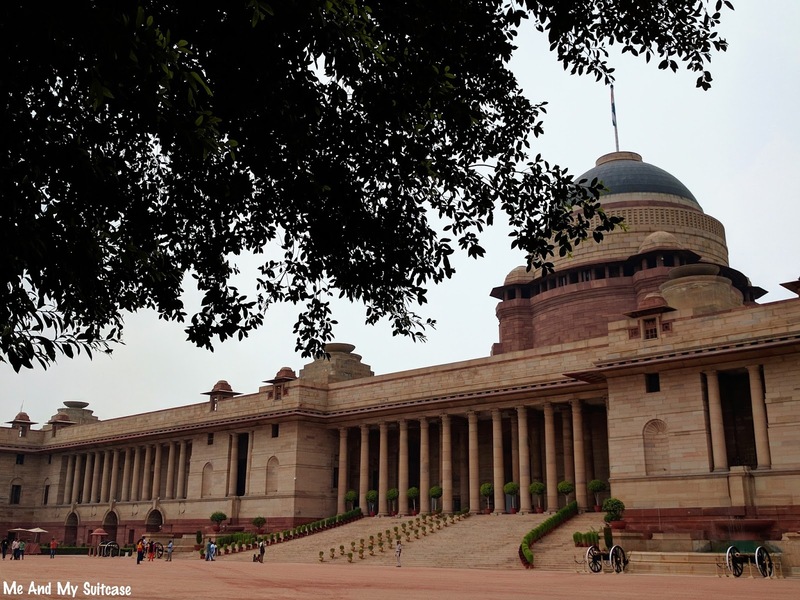 Rashtrapati Bhavan along with secretariat is nestled on the plateau of Raisina Hill. When Britishers planned to shift the capital from Calcutta to Delhi, they wanted Viceroy's House, the palace to be of same stature as his. Huge lands were acquired and planning of the city, New Delhi started. The British architect Edwin Landseer Lutyens was given the primary architectural responsibility who was also a major member of the city planning process. Lutyens was given the responsibility of designing the Viceroy's House while designing the secretariats lied with Herbert Baker. Rashtrapati Bhavan consists of 340 rooms with a floor area of 200,000 sqft, it was built using 1 billion bricks and 3,000,000 cubic feet of stone with little steel. Built in the period of Edwardian Baroque (Neo-Baroque architectural style of many public buildings built in the British Empire during the Edwardian era (1901–1910)) when the main highlight was to use heavy classical motifs to emphasize power and authority, the design process was long, complicated and politically charged. Lutyen's earlier design were entirely European and were frowned upon by many. He was told to prepare designs which could blend with local but his disrespect towards local buildings was evident. Later he gave in to the political pressure and the his designs went on to include circular stone basins (water fountains), elephant structures, traditional Indian chajjas, jaalis, chatris to name a few. However, the dome of the Bhavan is inspired by the Pantheon of Rome among other Mughar and European architectural elements which are used in the design. View of Presidential Estate from Church Road - Brassy Avenue "Gate No. 38"
We had reached at the designated time and were permitted to enter after the security checked our ID-cards and the request receipt. The walk from the gate no. 38 (via Church Road-Brassy Avenue) to the Bhavan was overwhelming. I could not believe that I will be inside President's House in a few moments. As we reached the reception, we deposited our bags and all electronic gadgets (No you can't click pictures inside). Then the guided tour started. Every slot/ group has some 15 - 20 members and a guide who takes you through the house. Our first pit stop was on the steps of the south ash-grey marble staircase to the first floor where Sahastrabahu Buddha Statue finds its place. This 1000 arms statue of Buddha was a gift from Vietnam government to the then Indian President Dr. Sarvepalli Radhakrishnan. Then we were taken to the famous Durbar Hall where the many civil and defense ceremonies are held. The design and glory of the Hall is flawless and simply majestic. The Hall is right under the central dome and has a seating capacity of 550. Next was Ashoka Ball Room, beautiful, the most fascinating and elaborately decorated huge room with Persian ceiling and a kashmiri carpet to cover the floor. The floor is wooden and this place was used as State Ballroom during British rule while it is now used for many ceremonial events. 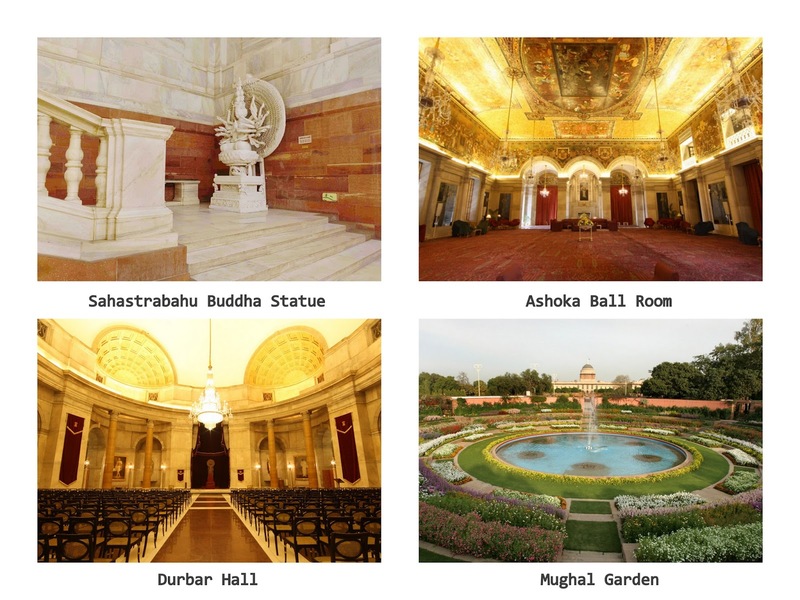 Adorned with many paintings and minimal furniture, our guide told us that right behind the curtains of the Ashoka Ballroom is where the President reside with their family (residential area). Wish I could take a peek. Then we toured through the Evening Drawing Room, Meeting Room opposite to it, Dining Hall (capacity 104 members). Later we were taken to Mughal Garden but not before when guide showed us an arch with little bells architecturally blended in the design which symbolizes silent bells and the silent rule of Britishers over the world. 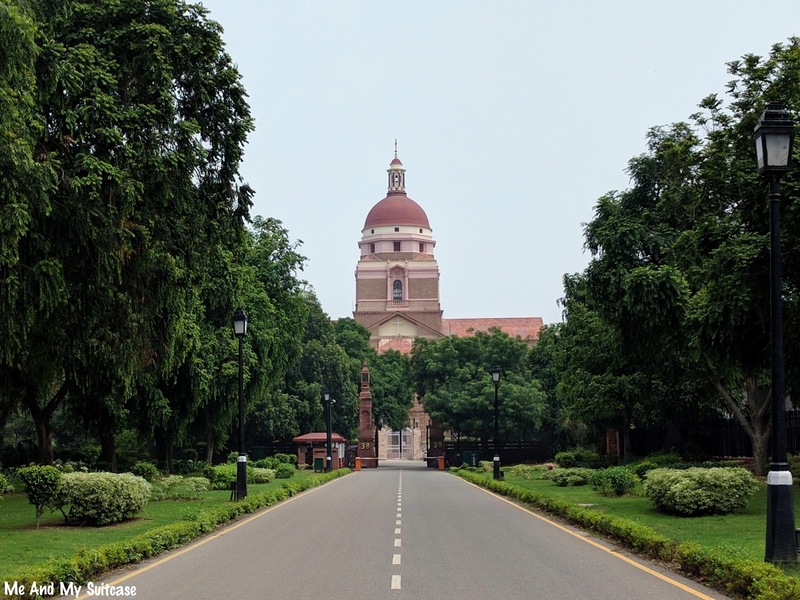 Spread over 15 acres, Mughal Garden is considered the heart and soul of the President House and is consisting of the rectangular garden, then the long garden and finally the Circular Garden. It draws inspiration from the Mughal Gardens of Jammu & Kashmir, the gardens around the Taj Mahal and the paintings of India and Persia. The garden has many flowers but rose remains the main attraction. Though part of the Presidential House tour, the Mughal Garden is open to public during Udyanotsav. After spending some time at the Garden, the tour ended with a visit to the little curio shop from where I bought some post cards. If you want, you can also spend some time, have food at their canteen. Post tour we clicked some pictures in the complex (yes, you can only click pictures outside) and then with a satisfactory tour left the house of the then president Shri Pranab Mukherjee. 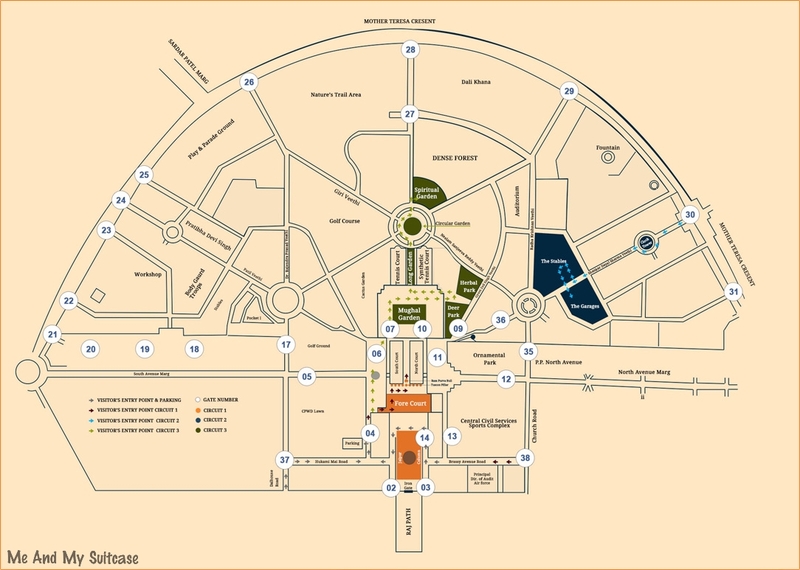 How to Reach Rashtrapati Bhavan: Rashtrapati Bhawan, President's Estate, New Delhi, Delhi 110004 - located at the western end of Rajpath and straight across it is India Gate. 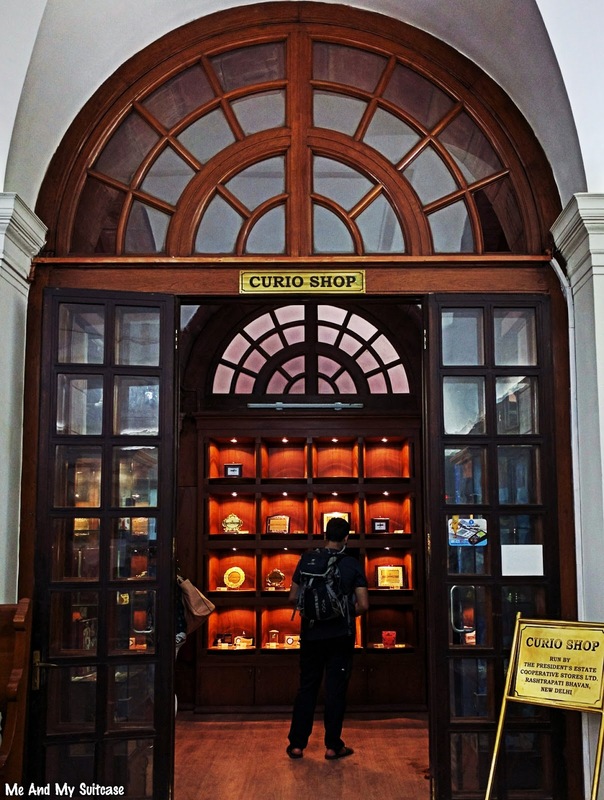 What to buy at Curio Shop: Notebooks, Postcards, Books, Frames, Paper weight, Key rings, Bookmarks, Table clock, Fridge magnet, Badges, Mugs, etc. P.S. All pictures are taken by me unless otherwise mentioned. This trip was made in 2016 hence the first picture says "Pranab Mukherjee Veethi"
It is likely that 'Pranab Mukherjee Veethi' still remains there. They tend to name certain places within the compound after the president permanently. Wonderfully articulated! I have never visited the Rashtrapati Bhavan, would love to one day! 340 rooms! I wonder what they do with so many rooms. A trip to the Rashtrapati Bhaban had been on cards for long. Thanks for all the tips, it will definitely help me plan my trip. Wow, I didn't know that we can visit it. It is a shame that I have still not been here. We have one of the world's best!